See how our corporate volunteer groups are impacting the communities in Southeast Louisiana! 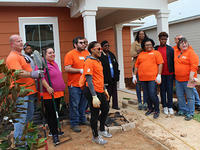 The Home Depot Foundation and Team Depot, their 385,000-strong army of associate volunteers, work to improve the homes and lives of U.S. military veterans and their families and aid communities affected by natural disasters. Through Team Depot, thousands of associates dedicate time and talents to these efforts in the communities where they live and work.